Yerba mate is a drink well loved by natives of several South American countries. November 30 is even National Yerba Mate day in Argentina! But even if you’re not from Argentina or a neighboring country, you can be a fan of mate too. Several celebrities are, including actor Kevin Bacon and model Gisele Bundchen. Popularity isn’t all mate has going for it though. Full of vitamins and nutrients, the drink is also fat-free and low in sodium and calories – a much healthier choice than coffee or tea. You can pick up some mate to try for yourself at many local groceries stores, but if not, it’s available at online stores like Amazon. 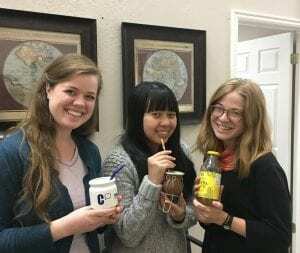 The CommGap Team loves to drink mate. Enjoy!